Young eco-warriors took to the beach to help get their message across about protecting the sea. 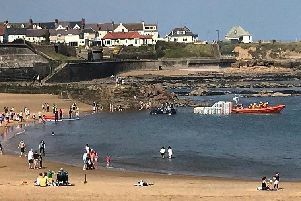 Nearly 100 pupils at Stephenson Memorial Primary School took to Cullercoats beach on Tuesday to urge visitors to ‘Save Our Seas’. The youngsters, who were in the Wallsend school’s nursery and reception classes, marched along the beach with their specially-made placards and banners. The three to five-year-olds talked to the people about the sea, pollution and the danger to both fish, plants and sea animals. Judith Fraser, class teacher and Eco Leader at the school, said: “We were all looking forward to an exciting and fun way to get across the message of how pollution is harming our environment. “Our project this term has been ‘Save Our Seas’ and the children are very knowledgeable about sea animals and the pollution in the sea. “They have spoken to local fishermen and conservationists and have visited the Blue Reef Aquarium.